My heart is bursting as I write this. Much work has gone into the reopening of my shop this week. I generally close down in June exhausted and feeling like I have nothing left in the creativity department. Then a few weeks go by, I begin seeing fun inspiration here and there and before I know it I'm relaxing and doing some creative things just for me. My creative bucket is somehow restored and by about early August I'm starting to think about my shop and getting excited by what I can stock it with. This season it was all about the watercolors. They have always been my first love and I actually took the time to relax and paint on warm summer evenings, just letting ideas take form. So with that familiar nervous knot in my stomach, wondering how they will be received, I present eight new watercolor prints, one ink drawing, a new dishtowel design and of course the old favorite items that continue to sell. 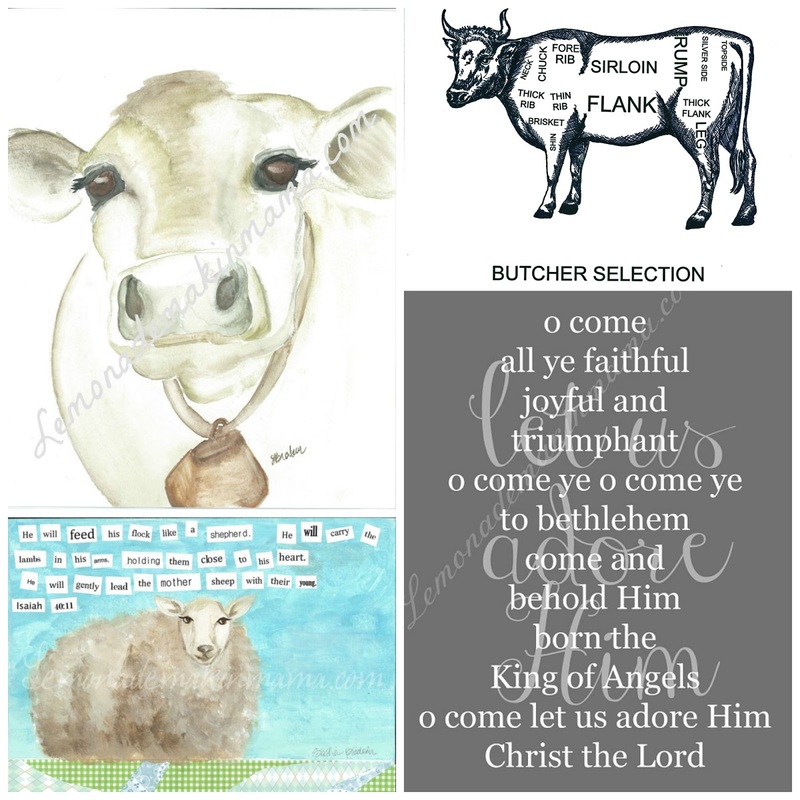 Below is everything you will find stocked in my shop this season and I hope you enjoy, maybe find something you love, or something to give away and bless another with. I pray over each painting before I make it, generally during the process and I always give thanks once it's complete. 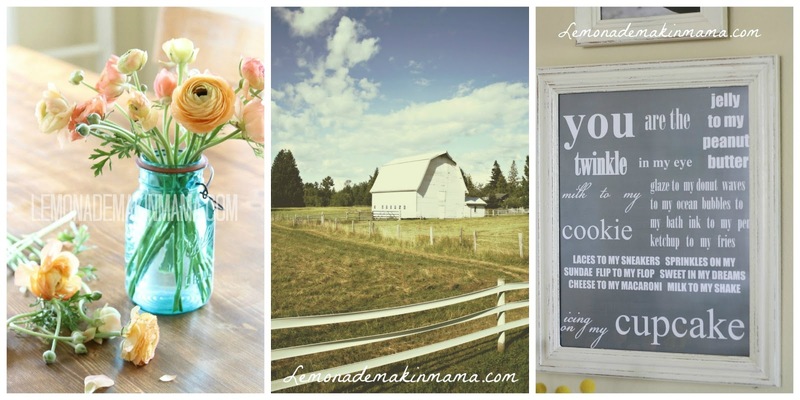 I pray that each piece adds something peaceful and sweet to the home it graces and I thank YOU for being my supporters, customers and encouragers. Without YOU, there would be no shop. Each print is 11x14 in size, printed on high-quality 80pound card stock. Watermarks will not be shown on your prints (obviously) and they will come wrapped in brown paper and shipped in a tube. Computer screen resolutions may vary, so please note that the exact coloring of your print may look slightly different in person. All items and prints can be purchased here. 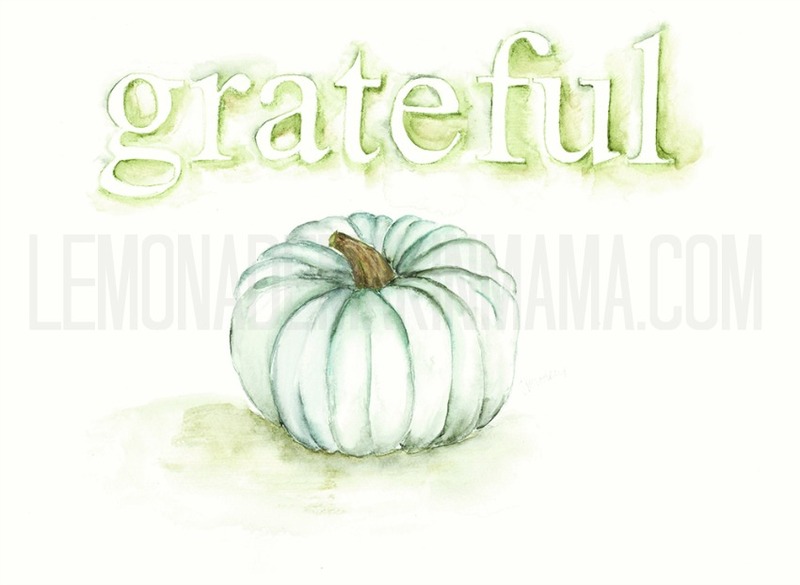 Blue Moon Grateful Pumpkin print. I sure love this one. And we can always use that reminder to be grateful, can't we? 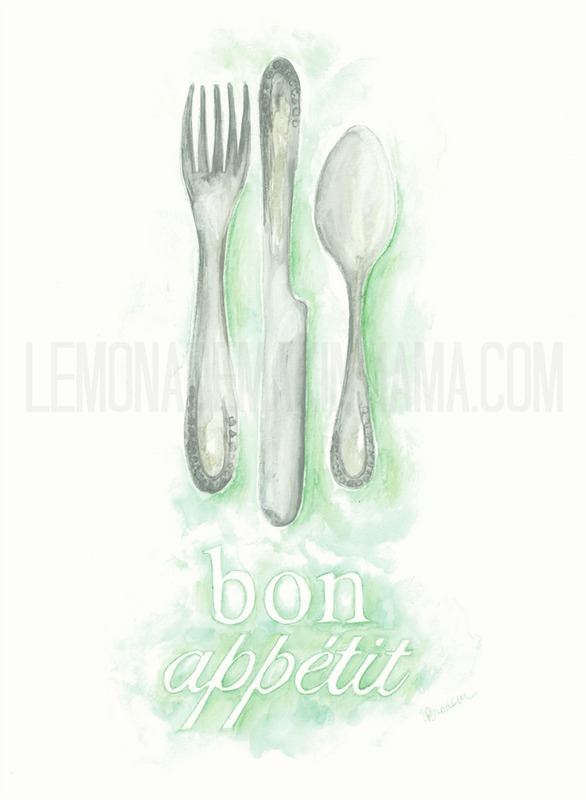 Bon Appetit Cutlery print. Just fun for a hard working kitchen. 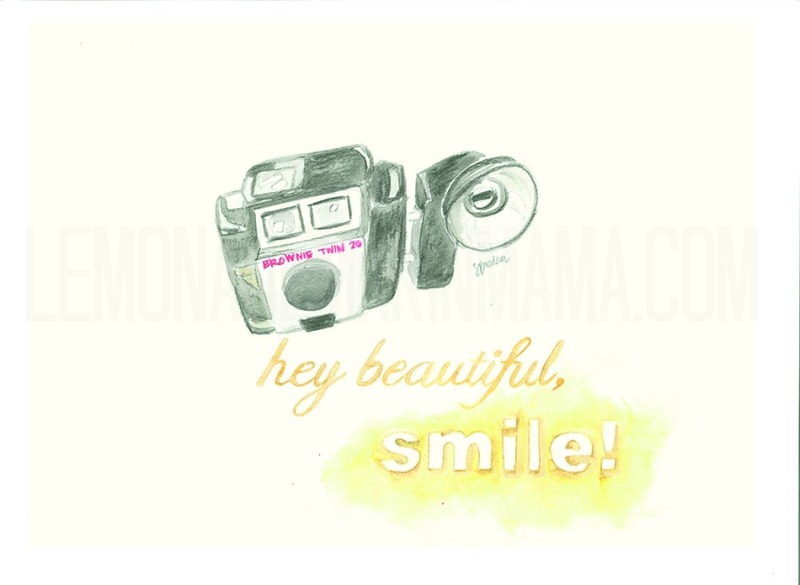 Hey Beautiful, smile! Vintage camera print. I collect vintage cameras and this one is my favorite so I painted it. It's cheerful and a good reminder. 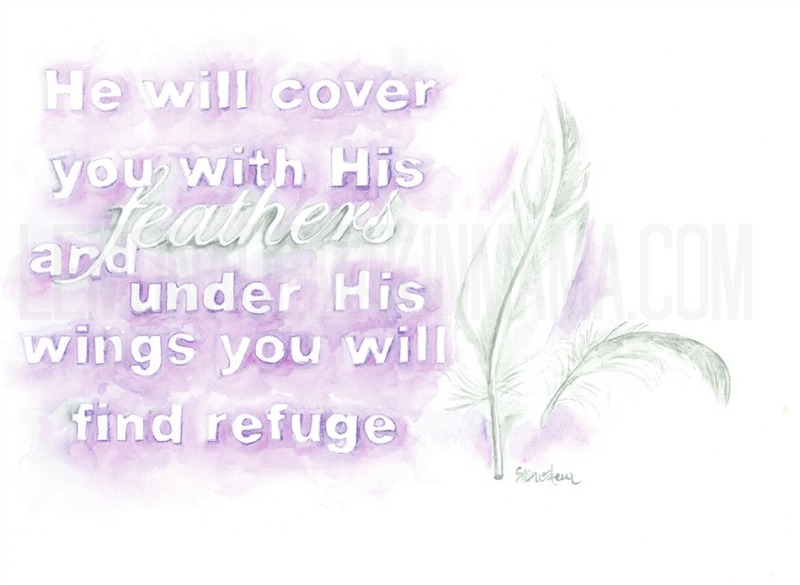 He Will Cover you with His Feathers print. I remember hearing a story years ago, about a forest fire that devastated a wooded area. When the firemen walked around the ashes later, they saw a mother bird on the ground, her wings spread out wide, around her. 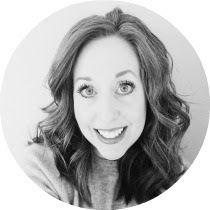 She was dead but they heard the distinct cheeping of hungry baby birds and when they shoved aside her charred remains, they discovered several small babies underneath her, alive and safe. I think that is a very real picture of what its like when God promises to give us refuge under His wings, as life's fire rages over us. Taken from Psalm 91:4. 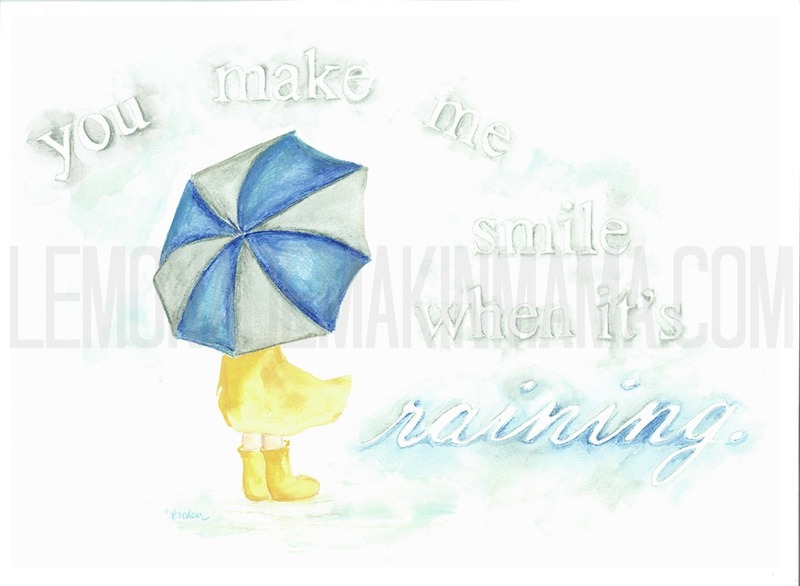 You Make Me Smile when it's Raining print. This one was my mama's favorite. Yeah, it rains a lot here in the Pacific NW. 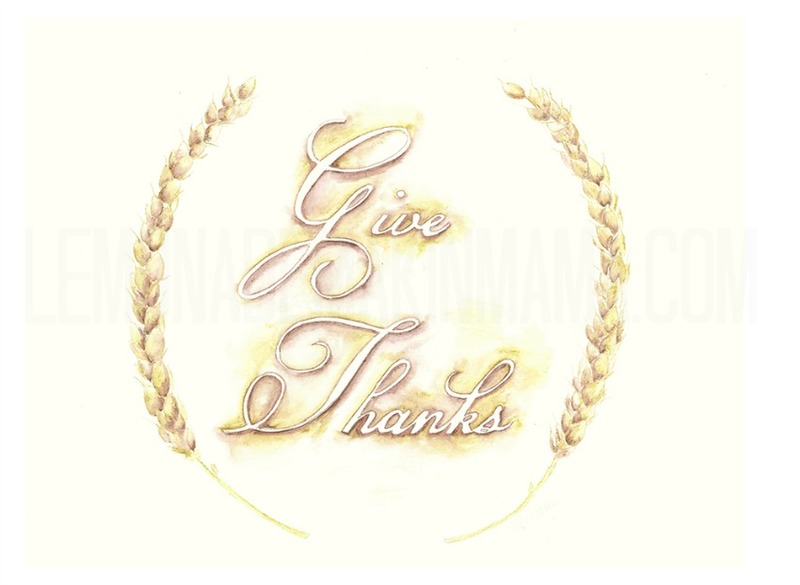 Give Thanks Wheat Print. My personal favorite. Who knew painting wheat stalks would be so much fun. I want to create more with wheat! Perhaps I will. 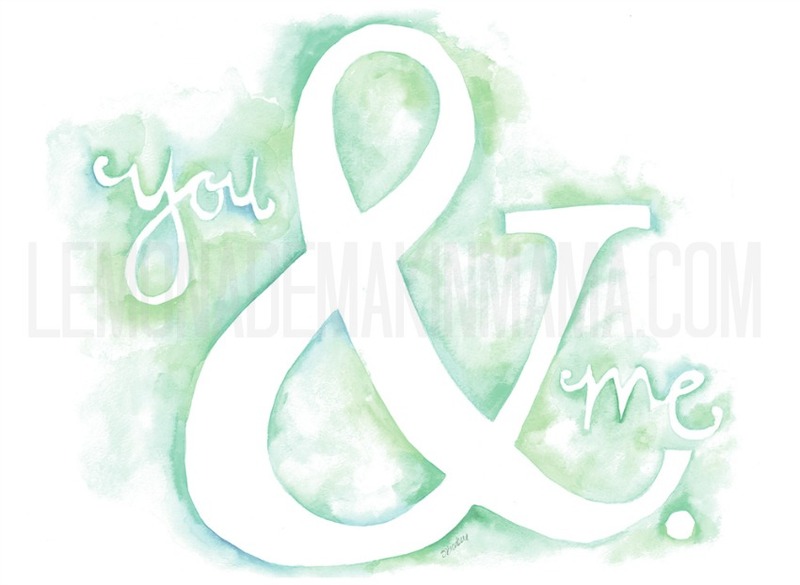 You & Me print. Just a sweet one. 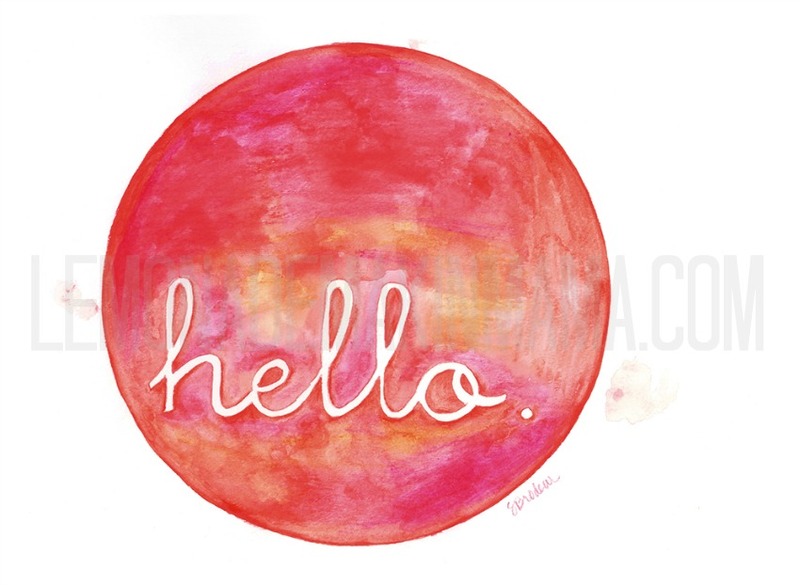 Hello Circle Pop print. This one makes my heart happy and I can't explain why. Even the watercolor smears on the sides make me happy. Favorite dishtowels to DATE. Love these guys. (Individually printed, so ink consistency may very slightly from pictured items, but all are LOVELY!) I also have some irregulars (SOLD OUT) in the shop at half prices, as usual because some irregularities don't make the cut. Which is great news for those of you pinching pennies. He has eyelashes. I needed to point that out to you. 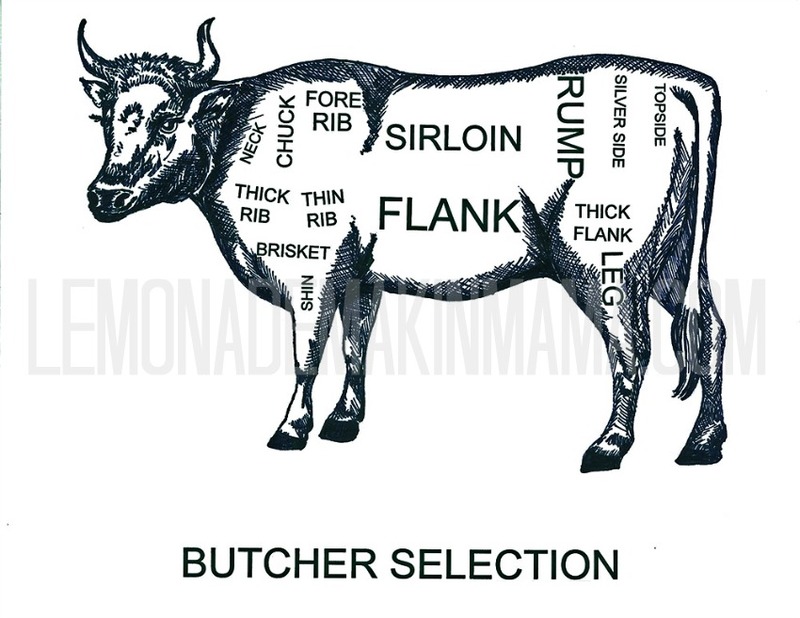 Makes me want to whip up a pot roast. Clockwise from left: Ranuculus bouquet (also available as a canvas in any size, prices vary, by special order) White barn (also available in canvas) and the You Complete Me print. Clockwise from top left. 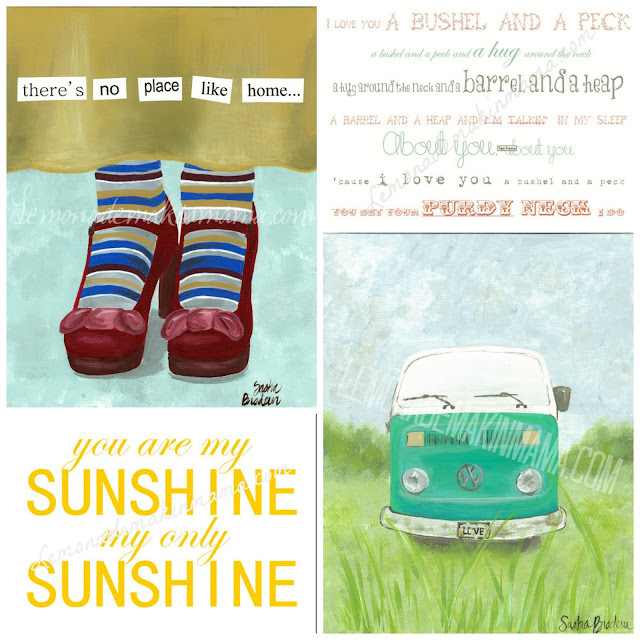 There's No Place Like Home, Bushel and Peck, VW Love bus (also my personal brand) and You are my Sunshine print. 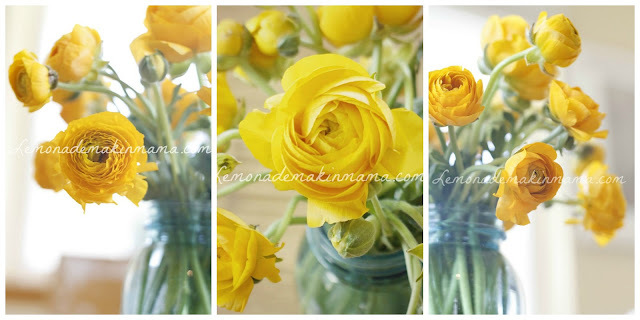 Yellow Ranuculus prints. (All available as canvas prints, prices vary and by custom request only. ) I have all three above my bed, shown here. Here are the details. PLEASE READ CAREFULLY so that (hopefully) all your questions are answered. Garlands are going to be listed at the same prices as last year, $35 for a 6 yard total roll (arrives in two separate 3 yard-long pieces) and shipping/handling cost will be $4.00. There is an additional $1 shipping charge for each garland after the first one. Individually hand-stamped onto white crinoline fabric (for durability and pretty light filtering) with archival ink, each garland reads, "wonderful counselor, mighty God, everlasting father" and then "prince of peace, emmanuel, king of kings, lord of lords." I have separated this garland into two pieces, each approx 3 yards long, for approximately 6 yards, total. These would be lovely woven into a large wreath or banister railing as well. Stamped in black ink onto white fabric in lower case letters- the "g" for "God" has been raised slightly in height, out of respect for the Name. Each garland is 4" wide. Because each letter has been hand stamped by imperfect people like myself, each garland is charmingly imperfect and ink transfer varies slightly from letter to letter resembling that of old typesetter fonts. Care: Do not wash, or use outdoors. If dusty over time, gently shake out, or run through a cool dryer cycle. The wait list closes as soon as I have all my open garland spaces filled up so first come, first serve and there is no limit on how many you can reserve. Please reserve what you think you will want because though cancellations do happen, changing your mind is not necessarily recommended and I may not be able to alter your reservation if spaces are already filled. Production for the garlands begins in early October, and will be shipping out from mid October through November. I will send a PayPal payment invoice as soon as they are ready for you and will ship them as soon as Paypal notifies me of your payment. To get on the reservation list, please email me at lemonademakinmama@comcast.net. Include the following: Your full name, and the number of garlands you want reserved in your name. That's it! You may purchase items in my Etsy shop... here. And now I shall go nap... and maybe hide for a day. GORGEOUS! I adore the lettering and how you used the negative space with the water colors around them. It's hard to pick favorites. The pumpkin, the You and Me colors are exactly what I am going for in the house but the Hello, oh that might be my favorite. It makes me smile every time I look at it. B is requesting that you add a pig butcher selection tea towel to next year's shop :) He would like them both! All of them just so happy. Well done friend! LOVE!!! Do you have a favorite place to get your white frames or do you often paint them? This is a great collection, this makes me smile big for my Dad. Love that you used the little pitcher. Oh my goodness!! I went to visit my grandson in Vienna, Austria this summer and every single night I sang: Bushel and a Peck AND You are my sunshine!! I may need BOTH of these!!!! Sash!! 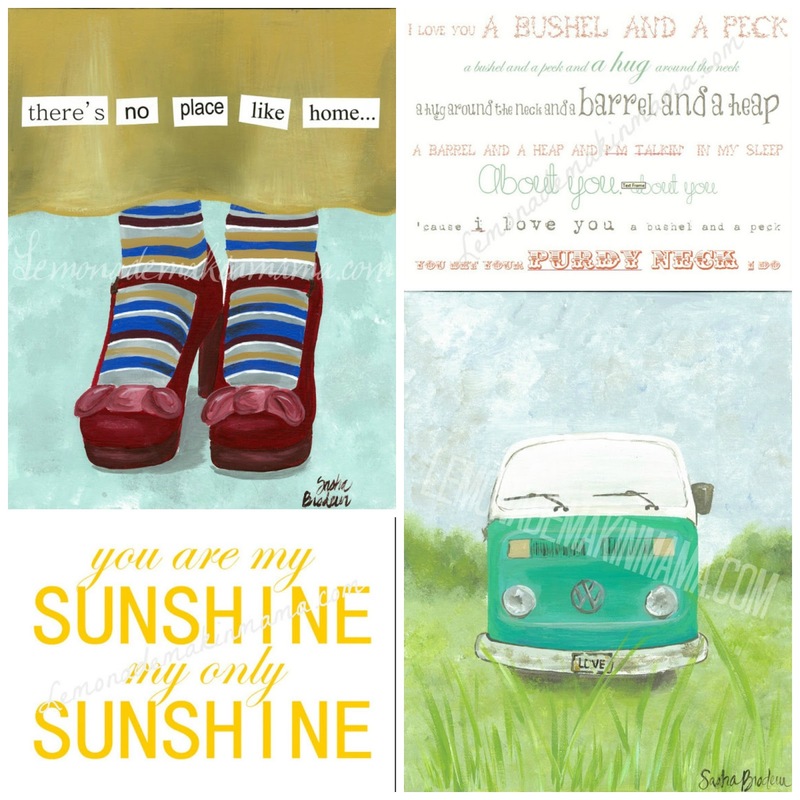 These watercolor prints are stunners. You are amazing. I'll take one of everything...I WISH! Your art is heartwarming. I adore everything. Sasha you have such a gift! How blessed we are that you share it with us!! Reserved my garland - yay!! I love the garland!!! Just curious if you make others with different sayings, like perhaps a favorite Christmas song? Beautiful work, Sasha! 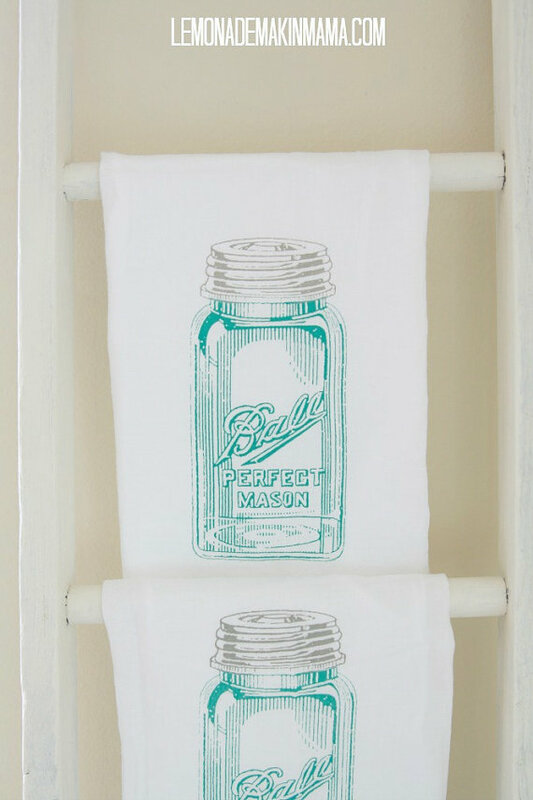 I bought a couple dish towels and dinner napkins several months ago and love them. Those paintings are amazing- If I could right now, one would be mine for sure! I just ordered your precious Blue Moon Grateful Pumpkin print. I am excited to hang it in my kitchen and I especially love that you prayed over it! :) May God continue to bless you and your family. You are such a sweet blessing to your reader friends in ways you may never know until you get to heaven. Beautiful work, you are truly a gifted lady and I am loving my dish towel, can't wait for the garland. Wow, everything is so beautiful!! I just ordered the No Place Like Home ~ have wanted it for eons. Next, I'd love the Grateful print. You are so talented!